You really wish there were studio recordings of this material... it's incredible. This CD is great, if you like Fugazi I suggest giving this a try...sort of a missing link type of thing, in my stupid opinion. Would have been great if they had recorded a proper album, still rad though and better than decent sound here. 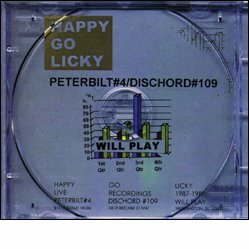 This release compiles the six songs from Happy Go Licky's Peterbilt 12" with 15 previously unreleased recordings drawn from live tapes. Released in 1997.